Making your bathroom pet safe sounds like overkill. But if you’ve ever had a puppy or cat in the bathroom overnight and they have chewed through the supply line on the toilet,this will save you a lot of money as oposed to paying an extreme water bill. Yes, it can happen, and has happened to me. Besides the mess of a flooded bathroom and having to replaced the vinyl tile that came up, the bill from the water department was slightly more than $180 more than normal. And if I had thought about it, it only takes a few moments to make the bathroom pet safe. Turn the supply line valve off to the toilet so if it does get chewed, you don’t have an extreme bill. For puppies especially, that soft, pliable line is a perfect size for a puppy to chew. Wrap the line in a towel so he doesn’t find it. Close the lid on the toilet so it doesn’t create a problem if your puppy exploring. Make sure the tub doesn’t have any water in and is drained. Make sure that the shampoo and medicines are off the floor so your puppy doesn’t accidently poison himself. The bathroom is a small room that often is perfect to house a puppy/cat at night with his water and food dish. It just takes a thoughtful moment to insure his safety. Sale of unsterilized dogs and cats prohibited? Hawaii sounds like a wonderful paradise, but recently in 2012 the legislature is considering a bill that will make it illegal to sell a cat or dog unless it has already been spayed or neutered. In 10 years or less, what sort of pet population would you expect in our 50th state? No kittens. No puppies. And I imagine any imported animal would have to fall under the same law — if they make this into law. How many other states would adopt this same law in the continental U.S.? I was raised with cats and kittens, dogs and puppies. We always found homes for the offspring without a problem. And raising cats especially was a great learning experience with the kittens. I cannot imagine that a state would even attempt such a law — which has not been passed as yet. It is only under consideration. It does sound like the state is shutting down puppy mills. And that probably is a good thing. The law will not apply to shelters or humane societies, so it sort of sounds like the shelters and humane societies will be the only ones breeding pets. I’m not sure what sort of trickle down effect that will have in the future. Shelters will be the new puppy farms perhaps. They will certainly have total control on the population, and maybe that is for the good. There won’t have the inbreeding of poodles and labradors = labdoodle. But I feel sorry for the cat or dog who would have loved to have at least one litter before being fixed. And I’m sure there will be some underground breeding farms that will be illegal, and therefore the price of a non-spayed or neutered pet will go sky-high. Most people won’t be able to afford them, nor will they be able to take them to a veterinarian for annual care, as they would be reported as illegal. I’m curious if the state of Hawaii is actually trying to rid the islands of pets, period. It wouldn’t take long to rid the islands of all but the very old cats and dogs if all the pets were to be fixed. But at what price to the community, and to the children? I grew up with cats and dogs and never knew there was a problem. But when I moved, I realized a lot of people believe they can never get along. That’s sad when people train their dogs to chase or worse, kill cats. Granted some dogs seem to be bred that way. I guess of just never owned one. We’ve had shepherds, collies, lots of mix breeds, cattle dogs, chows, beagles, blue heelers. And they all got along fine. If you have a dog that chases or kills cats, realize that it is illegal to kill a neighbor’s pet. You need to retrain that dog, and quickly. A few years ago our tiger cat, “Tiger” was sunning himself in the front yard. Two large dogs were running up the street and spotted her. I ran for a baseball bat and was outside in a moment. “Tiger” was use to dogs and stood up, arching her back. I ran at the dogs trying to scare them away, flailing the bat. In an instant, one of the dogs grabbed our cat and flung it a few feet away, while the other dog was trying to fetch the small piece of fur. I wailed at the wind, missing the dogs with the bat, but they finally ran away. “Tiger” was still alive, and I went back into the house to get a cookie sheet so I could brace her limp body without further trauma and take her to the veterinarian. I tried gently to move her unto the sheet, but I heard her spine snap. All I could do was pet her and cry as she slowly passed away. I was furious with these dogs, and their owner. “Tiger” was the sweetest cat and belonged to my kids. Killing a neighbor’s pet, small dog or cat is illegal. If you have a dog that chases or kills other small dogs or cats, fair warning. It’s is illegal to kill a neighbor’s pet. Get your dogs trained BETTER! Don’t say it’s the breed of dog because that is not an excuse. This wasn’t suppose to happen! I have two cats (both ferrel) and two dogs. Now another cat shows up at my front door. I don’t know what to do. It’s going to be freezing tonight, and I have this beautiful female all black cat showing up at my door, as friendly as any kittden could possibly be. I’m afraid she will freeze during the night, so I opened the door, and she walked in…amid the two dogs and two cats. It’s weird. I’m not a cat lover as much as a dog lover. But my old friend “Bama” — short for Alabama — came to me from a neightbor, and actually belongs to the neighbor. It’s just that the neighbor couldn’t keep “Bama” in his yard. She kept climbing over or under the fence, choking herself on the collar, until my neighbor said, “she’s yours, unless you move, then please giver her back”. So I have aother dog. Now I have cats coming to my front door and walking in as if they know me. I have a black kitten in the bathroom now as we speak. Don’t know where she came from. Have been feeding her at the front door for the last few days, and suddenly, she walks in the house as if its hers. What’s happening? I’ve set her up in the bathroom, away from the cold outside and the other pets inside. I don’t mean to be a pet magnate, but they seem to keep coming. All my cat’s are wild, and this one seems to be as well,but just as lovable, and I can pet her, and she didn’t seem terribly scared as I lifted her up and took her into the bathroom for the night with fresh food and water and kitty litter. She does seem to be without a home, and that breaks my heart. She’s a beautiful kitty, and my two dogs seem to accept her as such. Why are there so many abandoned pets out there???? They are so adorable. I have turned out such adorable kittens before, and they last out in the open less then a year. I cannot do that again. If this little black kittie belongs to anyone in the Independence, Missouri area, please advise. She needs a good, loving, home!! I’m not going to take her to a shelter, because I know her time there is limited. And there are so many kittens already there that are probably more adorable than she. Hopefully, if an owner sees this, they’ll call…816 254 0554….otherwise I assume she is ferrol, and like all my cats and dogs….no one seems to want them. So Sad!! You are missing out on so much love! But again,I only have so much room.and can afford so much food. Please open you doors for abandoned petsl This year, especially there are so many! Are You Feeding Your Beagle Too Much….Or Too Little? When you have more than one dog, it is sometimes difficult to control the weight of both. As you can see the black dog, the Blue Heeler is overweight, stocky without a waist, and her belly is rounded when you look at her from the side. The Beagle is trim, you can feel his ribs without them protruding, and he has a good waist when he stands. Purina has done a 14 year study and has written guidelines to help. You still need to depend on a dog food (I prefer dry kibble) that has all the vitamins and antioxidants and at least 18% protein. Simply, feed according to the current weight of your dog. So What Do You Do When You Need To Put One Dog On A Diet? Alabama, the Blue Heeler definately needs to be on a diet. I know she is older, so actually I need to take better care of her health. I never had a dog that ate too much, so this was new to me. My Dad always told me an animal won’t overeat. I mentally noted the amount of food she ate, and realized she would go to the bag of dog bones on the floor, duck her head in the bag, and pull one out — any time she wanted. The treats she ate were based in wheat as the main ingredient. I moved the bag of dog treats off the floor and into the back pantry where I would have more control over the distribution. “Bama” has since learned to beg. But within another few weeks she should be able to show a waist again. This would be a simple solution. 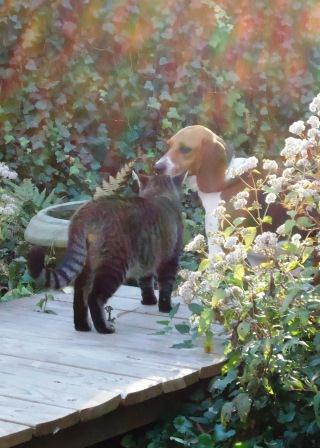 I also feed “Bama” outside with her allotted food, and the Beagle inside the house. Somehow I have to keep the two seperate until I can get the weight under control for overweight dog. If you have suggestions, would appreciate it.